What is the Information Processing Model (IPM)? In 1992, Maretha Prinsloo used a cognitive perspective to analyse the way in which people deal with everyday challenges, including work complexity, to develop the Information Processing Model (IPM). The IPM is a self-contained, holonic representation of the cognitive processes involved in the meaningful and purposeful conceptualisation of information. The model identifies interactive, functional categories of cognitive processing as well as the metacognitive criteria by which own thought processes are guided, monitored, controlled and corrected in a self-aware way. The IPM forms the basis of Prinsloo’s thinking process simulations aimed at assessing cognitive functioning. The specific simulations involved, namely the Cognitive Process Profile (CPP) and the Learning Orientation Index (LOI), measure the cognitive preferences and capabilities or the cognitive complexity and learning potential of individuals as required for effective functioning in job roles at various levels of work complexity. The IPM represents thinking processes holonically, which means that higher level processes incorporate aspects of the preceding levels while also transcending them. 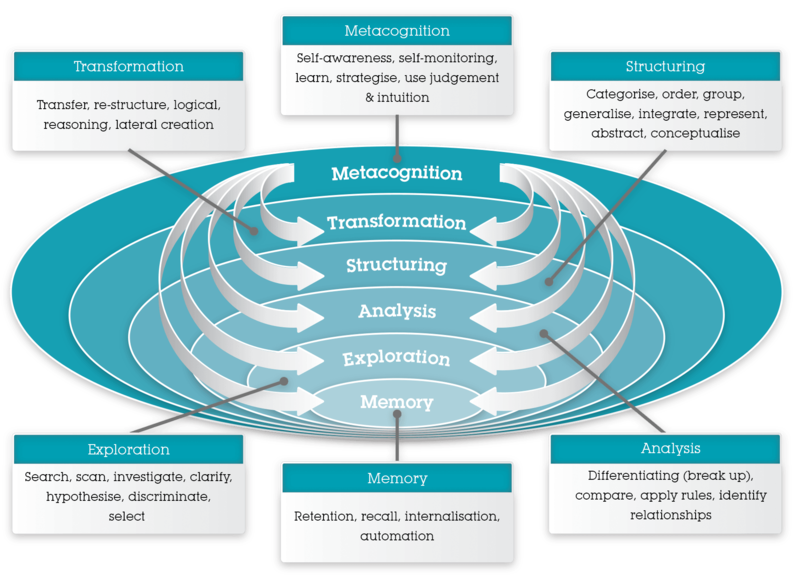 The broad functional processing categories include Memory, Exploration, Analysis, Structuring and Transformation. These processes each consist of many processing subcomponents, some of which can also be applied in other processing categories, but for different functional purposes. What information is important here and what is irrelevant? Do I understand this issue and is it clear to me? What don’t I understand? Do I need more information to understand the issue? Do I need to investigate it further? The metacognitive criteria involved in guiding thinking processes are graphically represented below. A simplified explanation of the holonic model and metacognitive criteria can be found in the blog “How to Think”. the degree of fuzziness or vagueness involved. The units of information are also structured holonically in that more complex units of information incorporate and transcend preceding units. For example, “Linear causality” includes “Separate elements”, but also transcends it. 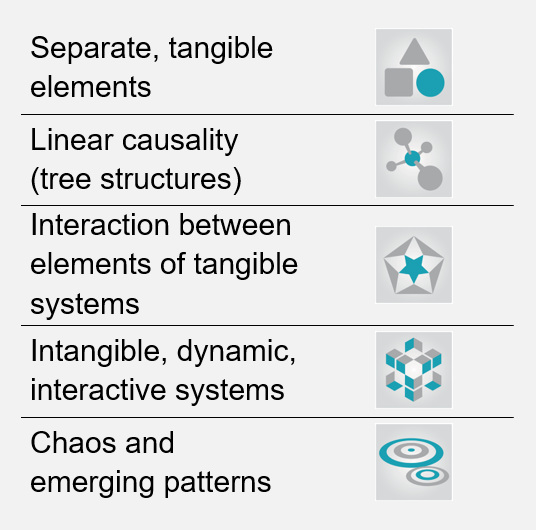 “Tangible systems” includes “Linear causality” and “Separate elements” but also transcends both, etc. Once Prinsloo unpacked cognitive complexity and identified the five units of information as an indication of a person’s complexity preferences and capabilities, the next logical step was to link human capability to levels of work complexity. Here, she capitalised on Elliott Jaques’s Stratified Systems Model (SST) and Stafford Beer’s Viable Systems Model (VSM). The outcome of this process will be given in “Applications within the work environment” section. As part of a PhD thesis, Prinsloo (1992) proposed and validated a unique self-contained theoretical model of thinking processes, the IPM. She proceeded to develop a methodological approach for the operationalisation, externalisation and tracking of thinking processes to enable the design of thinking process assessments. The technique involves a thinking process simulation. This was followed by the creation of the Cognitive Process Profile (CPP) assessment, which is an automated simulation exercise that externalises and tracks the operationalised IPM thinking processes in great detail, in tenths of seconds and according to thousands of measurement points. The results are analysed by an algorithmic expert system. The design of the Cognitive Process Profile (CPP) is primarily based on three sources of information on cognitive functioning and its assessment, including: an in-depth literature survey and critical review of a wide range of contributions within the field of intelligence research; the intuition of the developer; and thorough action research on how diverse individuals and groups solve problems, reason, conceptualise their understanding and act on such insights. the absence of a theoretical model by which a wide range of cognitive approaches to problem solving, reasoning and conceptualisation can be accommodated. Other cross-cultural factors were also addressed, such as those of an emotional and motivational nature as well as the values which impact on cognitive functioning. Examples of the latter include the discouragement of both quick responses and critical thinking in certain cultural contexts. Prinsloo, however, noticed the differences in cognitive functioning between various generations. She proceeded to develop the Learning Orientation Index (LOI) for younger candidates – particularly school and university leavers, or the age group of 16 to 30. Although the tasks involved in the CPP and LOI differ fundamentally, both tools are based on the IPM and the results of the two tools are comparable. The CPP and LOI thus measure the same thinking processes in very different ways. The CPP in particular, and the LOI to some extent, do not require correct answers or the application of a specific cognitive style. The assessments are not timed although the cognitive activities are measured in tenths of seconds to indicate constructs such as Speed, Quick Insight, Pace Control and Quick Closure. Very few processing scores are, however, impacted by speed-related factors. The focus of the CPP and LOI remains on the test candidate’s preferences and capabilities in information processing. These aspects include the measurement of cognitive complexity and learning potential. Detailed reports are automatically generated to support selection, placement and development decisions and initiatives. The CPP and LOI techniques introduced a new paradigm to cognitive assessment which transcends the limited, linear, domain-specific ability measurement techniques as well as some of the shortcomings of alternative approaches including assessment centres, structured interviews and “game” assessments. Cognitive complexity as measured by the CPP and LOI, lends itself perfectly to the matching of people capabilities to work requirements. For this purpose, and to address the interface between people skills and work complexity, Prinsloo adapted the hierarchical SST and the recursive VSM to correspond to the holonic IPM model. 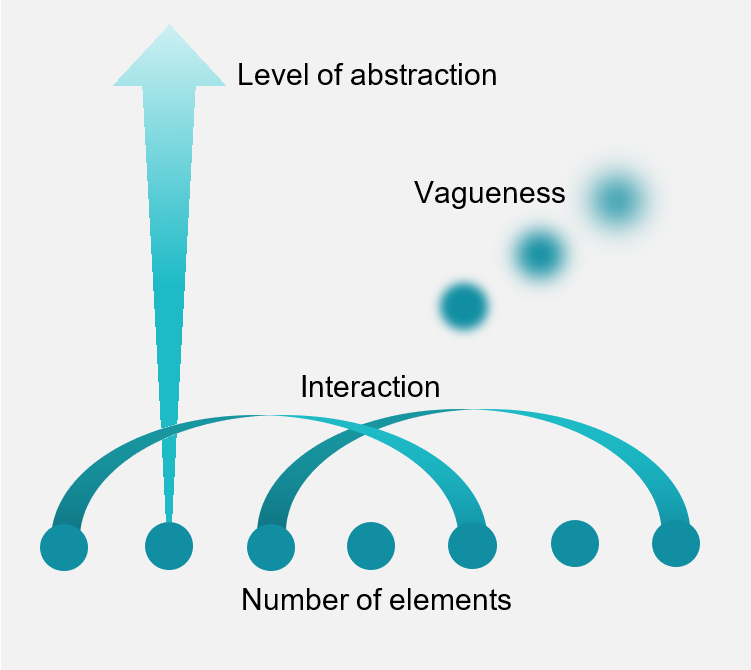 The proposed integrated IPM of work complexity consists of five levels of cognitive functioning, or work requirements, which are organised holonically. The levels of work complexity range from Pure Operational to Pure Strategic work. Whereas operational work is clearly structured and tangible in nature, strategic work is ideas-based, intangible and dynamic in nature. The IPM thus measures people’s information processing competencies and learning potential which inform the specific cognitive requirements of work. It is aimed at optimising the depth and quality of person-job matching and work performance predictions. For over a quarter of a century, the IPM, and the associated assessment methodologies, have been a fundamental part of Cognadev’s holistic approach to selection assessments, job matching and people development in organisations. Prinsloo has also developed the Contextualised Competency Mapping (CCM) tool for job analysis in terms of cognitive complexity, processing requirements as well as the broader holistic competency requirements of a role or a position. The Integrated Competency Report (ICR) is a holistic report which integrates multiple assessment results with the competency requirements of a role or position. An ICR sample report can be downloaded here. Through the years, Cognadev has developed a body of research evidence for the validation of the CPP and the LOI. The research manuals that detail these findings are available from Cognadev in printed form. Summarised versions are available in the CPP and LOI eLearning courses (which are required for qualifying as an accredited user). Further studies are published as a Technical Report Series and some as blogs on the Cognadev website and the Cognadev assessment delivery platform. This blog is part of a series on models of work complexity, which includes “What is the Stratified Systems Theory (SST)?”, “What is the Viable Systems Model (VSM)?” and “Models of Work Complexity: a comparison of the SST, VSM and IPM”. Descriptions of the Cognitive Process Profile (and a sample report), the Learning Orientation Index and Cognadev’s Technical Report Series can be found on Cognadev’s public website. “How to Think” explains information process competencies in layman’s terms and provides examples of the application of metacognitive criteria to enable effective thinking and problem-solving. “Cognition: theory, measurement, implications” is a useful and in-depth article which explains the history of intelligence research and the development of the CPP and LOI assessment techniques. Prinsloo, S. M. & Barrett, P. (2013). Cognition: theory, measurement, implications. Integral Leadership Review.